Expanding access to government information promotes transparency and entrenches core, democratic principles. When the government increases access to information proactively it means government institutions and civil society are working, and when the government does so electronically, it means the government is working efficiently. This is why last week’s unveiling of two new government portals that enable access to government information is encouraging news. Both portals are admittedly works in progress, but steps in the right direction. 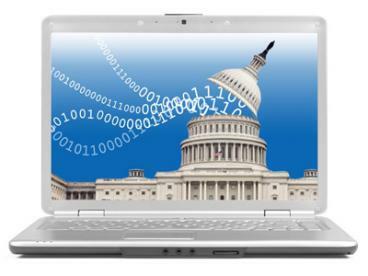 The launch of FOIAonline, a collaboration between five federal agencies (the National Archives and Records Administration, the Department of Commerce, the Environmental Protection Agency, the Merit Systems Protection Board, and the Federal Relations Labor Authority), makes the lives of both FOIA requesters and participating agency FOIA officers easier. 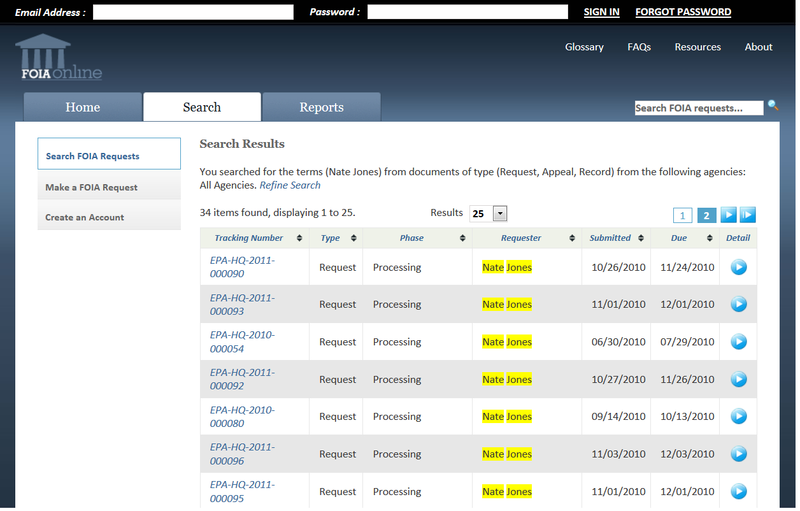 FOIA requesters can easily make, track, and search FOIA requests, and participating agencies can conveniently manage records and produce the annual agency FOIA reports required by the Department of Justice every fiscal year. To demonstrate how searchable the site is, I conducted a simple search for my colleague and prolific FOIA requester, Nate Jones. The screenshot below shows the results of my search, including the phase his requests are in, and their agency tracking numbers. The site is user-friendly, but could be improved if it provided greater detail on what phase the request was in, and even which employee was working on it. The next push will be to expand the number of agencies using FOIA online to provide better service to requesters while saving money. ISCAP declassifies a much higher percentage of appeals than individual agencies. The whole world can see who has requested, and successfully appealed, what. Since ISCAP is the final appeals panel, they tend to be the deliberating agency for the juiciest documents. While it is exciting that NARA is embracing digitized research methods, Executive Order 13526 requires ISCAP to inform both agencies and the public of the Panel’s appeals decisions, and the declassification portal does not fundamentally do this. As Secrecy News’ Steve Aftergood points out, the portal fails to shed any light on why the originating agencies’ decisions were incorrect in the first place. This means that well-intentioned agencies do not know how avoid making those same mistakes in the future, and that requesters have to guess what the root of agencies’ wrong-doing was, making future requests and appeals less effective. Despite some growing pains, increasing access to government information through e-portals is one of the most efficient ways the government can promote goodwill and transparency. We hope to see more, ideally all, government agencies embrace such portals in the future.